A plan for new student housing on Rowland Avenue may include converting the street in order to extend a pedestrian walk way. The topic came up at the city’s Planning Commission meeting on Wednesday. 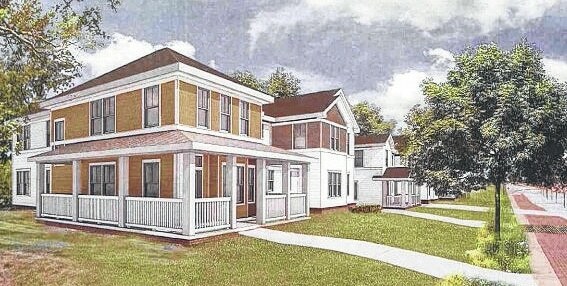 Ohio Wesleyan University sought feedback on its student housing plan, which involves demolishing existing houses on the north side of Rowland and replacing them with small living unit housing. The housing would consist of four buildings, which OWU representatives nicknamed “sluplexes.” Each building would be divided by a firewall, with 12 students living on either side. When completed, 96 students could live in the new housing. The current housing holds 36 students. The first building would be at the northeastern corner of Rowland and South Liberty Street. Construction could begin later this year. “They will be built as they are funded,” said zoning administrator Lance Schultz. To date, funding is available only for the first building. Existing housing would be demolished as each new house is built. Some local residents have said the existing buildings have historical value, but the university has said they have extensive maintenance issues and it would be cheaper to build new housing. Architect Randy Reger of Columbus-based BSHM Architects Inc. said the residents would be upperclassmen, and the homes would be themed by student interest. Schultz also said the city could vacate Rowland for the university to use as part of its JAYwalk pedestrian area. The JAYwalk was established in 1994-96, converting three closed city blocks into student walk ways and green space. “The city and university have discussed this possibility in general terms over several years and generally have agreed that it is a potential long-term plan,” said the staff report. The commission members asked how vacating Rowland would affect parking in the city, if the setback (distance to the street) would allow for more student parking behind the houses, and if closing the road to traffic would impact the city’s main fire station across the road at 99 S. Liberty St. The members also asked for a more detailed plan that incorporates all four buildings and the proposed vacation of Rowland. “We’d be doing the city a disservice by considering only the first building,” said member Adam Lemke.